Turkish imperialism has been unleashed. Erdogan is attempting to create a new version of the Ottoman sultanate by fighting both internal and international enemies. At the same time he is collaborating militarily with the Americans, and with the Russian in the hope that with the building of the Turkish Stream pipeline it will become the most important energy hub in the Mediterranean. Before he was with ISIS now he is against it. He is against the Syrian regime but also against the Kurds who are fighting it. In the meantime he is physically eliminating internal opposition in the name of building an “oil sultanate” which has an absolute need for order and tranquillity if it is to succeed. According to the common international political wisdom Turkey changed its attitude to ISIS because of the suicide attack on July 1 in Suruc which led to the deaths of 32 Turkish citizens. Previously the Turkish attitude towards the jihadists of the Caliphate was apparently one of non-interference in “Siraq” leaving things just to take the course dictated by others. In fact however it allowed the Caliph’s men to cross its borders smuggling oil and weapons, and setting up training camps, thus functioning in practice as a support base for the military and commercial operations of ISIS. Ankara’s Army not only remained a spectator as it was lined up a few hundred metres from the besieged city of Kobane but was letting it be conquered and allowing the massacre of civilians as it happened. Further it prevented the US from using its airports for air raids against the military apparatus of ISIS. Its only concern was the defeat of the Assad regime in Syria and if the ISIS militia were also fighting for this, so much the better. Then suddenly its alliance shifted. Ankara has begun to bombard ISIS, has conceded the use of the Incirlic air base to the USAF and in practice has joined the coalition against the Islamic State. As usual the explanation is not to be found in ideological or religious divisions or as in this case the tragic terrorist act which caused the death of 32 Turkish citizens but in the schemes of the aspiring neo-Ottoman sultan Erdogan to pursue imperialist objectives that, with continued support to Baghdadi, even if only secret and unofficial, he would never attain. 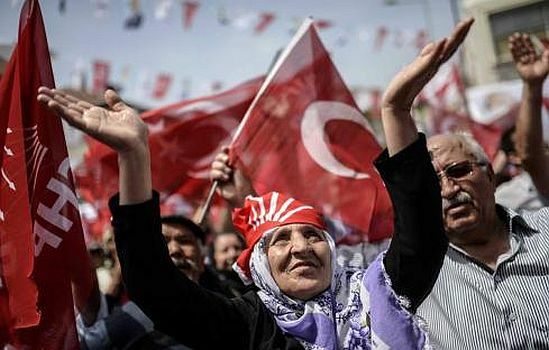 Erdogan won the June 7 election but without the absolute majority that he hoped for which would have allowed him to start a constitutional shift towards a quasi-dictatorial Presidency. This partial and inadequate victory forced him into a tactical review including gaining the consensus of political parties and anti-jihadists who previously were his political opponents. A revival of credibility in this sense would also allow him to take on the struggle within his own party, the AKP, against his vice president and bitter antagonist Arinc and his predecessor Abdullah Gul, more successfully. It would also appease some sections of the Army that, in some cases, have shown impatience with the foreign policy and other decisions of the President. In short, the aim is to turn the army into an armed force of the AKP party, or into some sort of private militia under the command of a renewed Ottoman Sultanate. All in the hope that the plans in place would enable him to win the already announced election, in order to get that popular support that would allow him to be the Sultan of the "new" Ottoman Turkey. The change of direction is also justified in equally serious and pressing domestic objectives such as the violent repression of domestic opposition. And alongside the bombing of ISIS positions in Syria, they have attacked Syrian Kurdish positions, the only ones, with some pro-Iranian training who currently oppose the advance of the Caliphate. Are these contradictions? Certainly, but the fact is that Erdogan is continuing the struggle against the regime of Bashar al-Assad as well as hitting his enemies, the jihadists of al Baghdadi and simultaneously weakening the Syrian Kurds to send a message to those at home so they know that for them there will be no nationalist future. Erdogan immediately, not without enormous concerns, announced the emergence of a "Kurdish autonomous state" in the north of Iraq. It is something long desired by American oil strategy. He fears that the possible disintegration of Syria will lead to the birth of another Kurdish enclave on his borders and in Iraq, stoking the ambitions for autonomy of "his" PKK. We have to understand two episodes of fierce repression within this domestic framework. The first concerns its bombardment of some PKK positions on Turkish territory, which effectively broke the fragile truce of 2012 between the Turkish government and Ocalan’s party. Erdogan's concerns about more radical behaviour by the PKK than allowed for in the agreements signed by its leader, have led to a preventive and repressive series of air raids on Kurdish - Turkish positions bloodier than those carried out against ISIS militants. This has made plenty of domestic and international observers believe that the fight against ISIS is more like a "good excuse” to fight the internal enemy. It is much closer and more dangerous, and does not constitute the Islamic State. The second, also on the domestic front, sees the builder of the neo-Ottoman Empire grasp the nettle to eliminate from the domestic political scene yet another uncomfortable partner. On March 31, a member of the self-styled Marxist Turkish Party (DHKP-C) slipped into the courthouse in Istanbul to seize and subsequently kill the prosecutor Kiraz Selim, head of the investigation into the death of a young demonstrator during the Gezi Park protests. The government's response was harsh. While there was intense bombing of jihadist ISIS, of Syrian and PKK Kurds, the secret police made about three hundred arrests among leftists, adding one more death as collateral damage. This paved the way for a series of attacks by both the Kurdish militants of the PKK and those of the DHKP-C on August 9, which ended with several deaths among both militants of the two organisations and the armed forces. None of these tragic incidents will stop the ambitions of Erdogan who will use them as part of his plan for the repression of terrorism. Either the labouring masses and Turkish workers mobilise in a revolutionary way or the would-be sultan will have an easier life for his domestic political games. The other factor that has forced the government in Ankara into this about-turn is the changed international situation, both as regards some of the changes in the imperialist balance of power, as well as regards Turkey's role within the changing world of revenue extraction linked to the distribution of gas to Asia and the ways of marketing it. The most important change in the imperialist balance of power in the region is certainly the recent agreement on the nuclear issue between the US and Iran. For Obama to have convinced Iran of its new course to sign the agreement is above all a success of international politics that was missing in the "c-v" of the almost retired American president. According to him, the agreement, which requires Iran not to think about an atomic bomb for ten years, would make the world safer, while maintaining unaltered the number of members of the nuclear club. That is to say his diplomacy has achieved a major breakthrough which otherwise would have left things as they were, in permanent crisis. In fact, the outgoing President is passing the baton to his possible Democratic successor with some good "results" in terms of foreign policy. In addition, the move by Obama has the stated goal, if not to pluck Iran from Russian influence, to weaken that relationship with all its consequences on the entire region. This includes the attempt to remove Iran from the intricate gas-oil strategy between Russia and China, by weakening its Caspian section. For President Rohani of Iran the agreement with the US is the end of a nightmare. The removal of sanctions will give some oxygen back to the economy of the ayatollahs, both in terms of trade and oil, reviving Iran as power in the region beyond the role it is already playing in Syria, in Iraq, in the Kurdish question, as well as within the contradictory political and military tensions against ISIS expansionism. On the other hand, for Turkey the agreement on nuclear power is the beginning of a nightmare. Its first concern is the loss of US support, even if this was already wearing thin, and had become tetchy and sometimes contradictory. This would cause a change in the balance of power in favour of Iran inevitably to the detriment of Turkey. And it is likely, in the light of this new situation, that the Erdogan government is posing as the "middle ground" in terms of international politics, trying to mend relations with the US and with "the enemy-ally" Israel, restoring the old relationship of military cooperation the Pentagon previously sought and established against Russia and its satellites in the Mediterranean. Hence the change of direction towards the Islamic State, the de facto entry into the anti-ISIS Coalition and the granting of the air base to the US, in order to nourish the hope of maintaining the relationship with the US government, and to continue to make Turkey the main oil hub on the shores of the Mediterranean. The now more than likely shift in US policy toward Iran would be a setback for the ambitions of Erdogan and his imperialist leadership which demands, at least, an attempt at rapprochement with Washington, even if they involve concessions that previously were not even on the agenda. This was already clear last March, when the nuclear deal with Iran was on the cards, so the government in Ankara signed a military agreement with Riyadh to unite their forces against the regime of Bashar al-Assad, by arming and financing armed opposition groups like the al Nusra Front and Ahrar al Sam whilst simultaneously fighting the jihadism of the Caliphate. Moves that, if successful, would enable Erdogan’s neo-Ottoman policy to draw closer to the US, to limit the damage of Iran’s likely reappearance on the scene and, more importantly, to continue to build its role as a key hub for Mediterranean oil. The changes in Turkey's foreign policy do not end there. Erdogan is a first-rate practitioner of the ability to keep a finger in more than one pie. Having taken a step back from ISIS in order to not alienate American imperialism, after lowering the tone against his Caspian arch enemy, the Iran of the new course supported by Washington, and reopened the dialogue with Israel, in order to pursue to the end of its imperial ambitions in the Mediterranean, Turkey has also stuck its thumb into the Russian pie. The story of Turkish Stream begins with Russia’s failure to kick-start its old project of the South Stream which was not wanted by Europe in order to avoid being totally dependent on Russian gas, boycotted by the US for obvious competitive reasons and made impracticable by the behaviour a Bulgarian government, which was well-informed about it by the US Government. Russia did not lose heart. On May 7, 2015, the CEO of Gazprom, Alexei Miller, signed a definitive agreement with his counterpart of the Turkish company Botas for the construction of a gas pipeline (Turkish Stream) that would bring gas to Turkey from the distant lands of Siberia through the Black Sea. The task of building the structure by 2016, by-passing the "treacherous" Ukraine, was given to Gazprom Russkaya. For Russia this is a great opportunity to pose once more as reliable supplier of gas to southern Europe and for Turkey a real possibility to build itself up as the only hub in the Mediterranean. But Erdogan's ambitions go beyond Russian energy resources. Also for the theory of fingers in more pies, there are also other energy resources to administer like those of Azerbaijan and, why not, even those of rival Iran, if the US would put in a good word there. Currently, the most important pipelines between the East and Europe pass through Turkey. Already in place are: the Iraq-Turkish-Ceyhan pipeline carrying Iraqi oil from Barzani’s Kurdistan and the BTC, which is the Baku-Tbilisi-Ceyhan pipeline. Alongside these are the Baku-Tbilisi-Erzorum, the Trans-Anatolian pipeline, the Trans-Adriatic pipeline, as well as Blue Stream. With Turkish Stream Turkish imperialism would have "real scale", so that in agreements with anyone, whether alliances that change depending on the already established gas-oil arrangements, or those in prospect, an iron fist can be used against anyone who might, even remotely, be a danger to the great neo-Ottoman project. Despite the deep differences with Moscow over Ukraine, Syria and the referendum in the Crimea, not yet approved by Ankara, the Turkish Stream agreement would open the door to other business opportunities despite being in contradiction with the pro-American policy Ankara seems to want to adopt. If the linearity of expectations was directly proportional to the oscillation between the various contradictory international imperialist poles, we would already have in the pipeline, the construction of a nuclear power plant at Akkuyu on the shores of the Mediterranean, in collaboration with the Russian company Rosatom, and the signing of a long series of economic and trade agreements that would raise the level of trade from the current $33 to $100 billion by 2020. In the wake of all that Moscow and Beijing, with an even wider imperialistic perspective, are playing the card of inserting Turkey within the Shanghai Cooperation Organization (SCO) in the clash, now out in the open, between the Euro-Asian Russian-Chinese and Euro-American axis. This perspective appears to be the equal and opposite idea to that of the American attempt to seduce Iran from Russian-Chinese influence. Within this scenario, so varied in the number and "quality" of actors, acting on their own interests and full of ambiguities, one thing is clear. In a Turkey that wants to limit the damage of the American nuclear agreement with Iran and enhance the agreement with Russia on the Turkish Stream a work of restoration within its national political structure and in the immediate vicinity of its borders is required. It is no coincidence that Erdogan changed sides on the issue of the Islamic State when he perceived that supporting its ambitions would involve a dangerous instability on his nearest border both immediately and in the future. And for the same reason he thought that if the rest of Assad ‘s Syria finally exploded there would be the risk of the emergence of a Kurdish state, the second one after that in Iraq under Massoud Barzani, which would increase the nationalistic ambitions of the more militant PKK, despite the about turn of Ocalan. So, weakening his Kurdish opponent and any other form of opposition inside the country is just as important, if not more so, than fighting the ISIS of al Baghdadi. The almost simultaneous actions against ISIS, the Syrians, the Iraqi Kurds and the parties of the radical left are, in fact, part of the process to contain the possible enlargement of the scope of Shiite Iran and an act of tactical prevention in defence of building Turkish Stream that, like all big business, abhors elements and situations of disruption that must be radically removed in toto and soon. Over and within the plots of small and large imperialisms which rule the history of the world in tune with their interests, move the dispossessed masses, which without an alternative social project, or a revolutionary political reference point, become the instrument of these objectives. At the mercy of ideologies of their ruling classes, these disinherited masses of workers on the brink of survival, end up falling into the clutches of this or that jihadism, whether Sunni or Shiite, but always serving the interests of the class enemy. The networks can even be those of secular or religious nationalism, but they always support our class political opponent. It 's time to break these networks, to give political meaning to the only possible alternative to capitalism, to its imperialist essence, its devastating crisis and its even more devastating wars. It’s time to build the international revolutionary party which provides the political pointers towards communism. It is begain with : "Turkish imperislism has been unleashed " we ask, what happened , it says: " Erdogan is attempting to create a new version of the Ottoman sultanate by fighting both internal and international enemies" it is a first factor that has forced the government in Ankara to choose it is policy? The question is it imperialism a policy or imperialism is the condition sine qua non for the survival of each nation. The other factor and " most important change in the imperialist balance of power in the region is certainly the recent agreement on the nuclear issue between the US and Iran" this agreement is not simply to prevent Iran from having a nuclear bomb! It is the problem of the supremacy of Iran in the region, Turkey was absent from the region because it is ambition for joining UE . If I understand your question we have long rejected the idea that imperialism is a "policy". It is the stage in which capitalism [and all its nation states] finds itself. The sentence "Tuirkish imperialism has been unleashed" was intended only to suggest that it has adopted a new and more active policy to promote its imperialist interests. The title states the article is about "shifting imperialist interests". Your second point is also not quite clear to me. Turkey has not "been absent" from the region (it gave up on the EU many years ago) but it has oscillated from one policy to another. It has been pro-Israeli and pro- Iranian, then after the Arab Spring pro-Muslim Brotherhood and anti-Israeli. It was constantly seeking deals (over oil) with Barzani's Kurdish Regional Government in Iraq (against the Al Malaki government) whilst becoming anti-Assad and neutral towards IS in Syria, Now it is opportunistically using the war on IS to promote its own agenda against the PKK and YPG and as the article says this is due to a mixture of foreign and domestic factors, However we agree with your last point as everyone knows that the Iran nuclear deal is not really just about the nuclear deal as such but about the shifting nature of imperialist alliances in the region.